Whatever your faith, I will be pleased to be with you. As we know, Asian weddings are usually quite large occasions with parties lasting for days, even weeks! 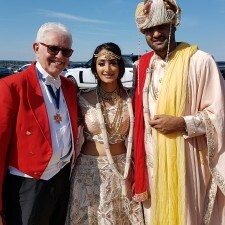 I would be pleased to guide you through your wedding day and offer my experiences through hundreds of Asian weddings to help you make yours that little bit more special. I have officiated at weddings with 180 to over 1600 guests and I find them the most wonderful array of bright colours, religion, culture and joy, ending up with the final reception and normally the biggest party of all! Whether your wedding is Sikh, Hindu or Muslim, or maybe a mixed wedding, the experience I have, will help you create additional highlights to your day, maybe attending the Gurdwara, welcoming the Baarat, assist or organise and call the Milni, attend at the Mandap, Shawl ceremony, Nikah and everything through to cutting and feeding of the cake, the speeches, announcing the dancers and finally handing over to the DJ for everyone to dance the night away! One of the greatest moments of the day is to make the special announcement for that "grand entrance" of the Bride & Bridegroom when they enter the room as man and wife, in front of all their guests. Oh! and don''t forget the parents - it's their special day too! One will gain a daughter and the others get a son, and everyone gains another extension to the family. Whatever your faith, give me a call on 0788 788 8488 and let us meet up to chat about your very important event. See what I can help you with, and add to your big day, not forgetting the parties leading up to the grand reception!